Oktoberfest festivities have already begun. With PosterMyWall, you can get the word out, and invite your friends or customers to your biergarten. With user-friendly tools, and thousands of templates and backgrounds to choose from, you can add text, font, and colors to complete yourcustomized flyer. 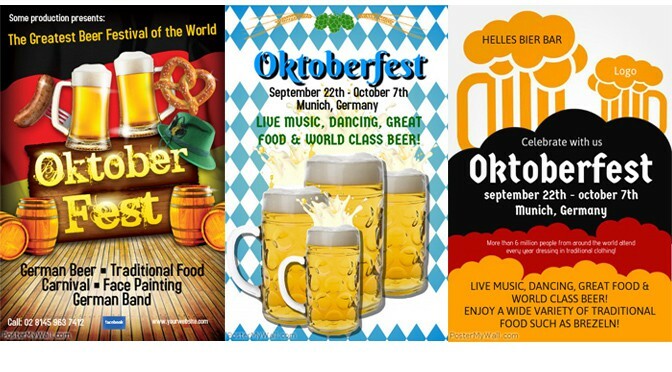 To get started, click on one of these templates below, or view our complete gallery of Oktoberfest poster templates. Take a tour and learn about the use of the many tools to make your desired poster a reality. Use our download feature to get a free download to print at home. But if you like it, buy higher quality prints on premium photo paper, just starting at USD 7.50!